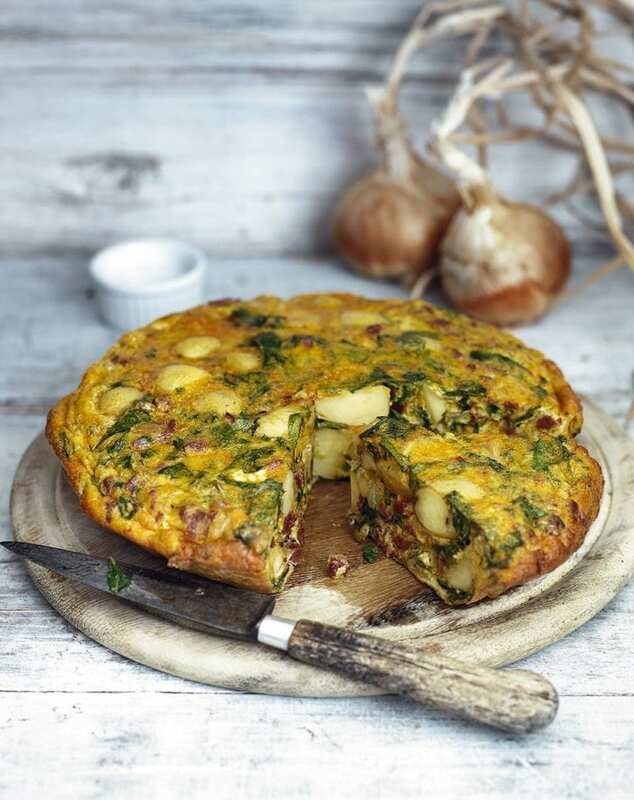 Raymond Blanc’s tortilla recipe uses jersey royal potatoes, which are available during the spring months, but these can be substituted for another non-floury potato at any other time of the year. Preheat the oven to 170ºC/Gas Mark 3½. In a medium sauté pan with a lid, over a medium heat, sweat the potatoes, onion and garlic in the oil with the bay leaf, thyme, rosemary, Espelette pepper or smoked paprika and salt for 13–15 minutes. Stir regularly to avoid any colouring. Add the chorizo and continue to sweat for 5 minutes with the lid on so the flavours mingle. Finally, add the parsley and spinach and stir them into the vegetables for 30 seconds, then remove from the heat, add the eggs and stir everything together until evenly mixed. Pour the egg mixture into a 20cm non-stick ovenproof frying pan and place in the oven for 15 minutes. Once cooked, remove from the oven and leave to rest for 5 minutes before turning out on to a board or a large serving dish. Using a serrated knife, cut the omelette into 4–6 wedge-shaped slices and serve warm. This dish offers hundreds of opportunities for interpretation using different vegetables and herbs – be as creative as you like.